Progressive International Microwavable S'Mores Maker Doesn't Actually Make S'mores For You | OhGizmo! One of my favorite summertime snacks has to be the s’more. I mean, first you have the fun of roasting a marshmallow over an open fire (without catching it on fire, unless that’s your thing). Then when you’re done, you’ve got a delicious, albeit messy, snack. So what happens when you want such a snack in the wintertime, or on a rainy day? You turn to your trusty microwave. 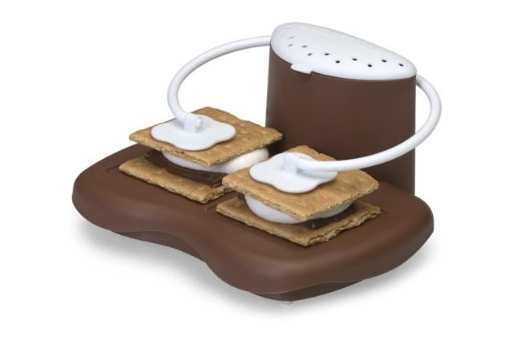 Well here’s a device that is supposed to help you in your task of making microwave s’mores. This is actually one of the more pointless devices that I’ve seen. All it does is hold down the top graham cracker to the marshmallow. Honestly, I don’t really care to make s’mores in the microwave, but at least it’s fun to watch the marshmallow expand to three or four times its original size. $7 isn’t much to spend on something like this, but just think of the many wonderful things you could do with that kind of money. What, like buy a gallon and a half of gas? I think this is brilliant. I prefer to just roast the MM over the stovetop burner as always. Half the flavor comes from the browning (occasional burning) of the MM anyway.